It has been an exciting few days. A visit to a friend in London necessitated a trip to Loop in Islington. I love this shop because it stocks little treasures that you often can't find anywhere else. You will see that I was tempted by the Isager Japansk Bomuld (cotton), a beautiful laceweight cotton with excellent metreage, (315 metres (344 yards)) and machine washable! Think i might take it on holiday to experiment with....... Second purchase of the week was the fantastic pouch that you see below. Made by Julia Billings of woollenflower from recycled Harris Tweed and lined with Scottish linen. Simple,stylish and superbly well made! On Saturday I met up with Emma Price at In the Woolshed to talk through recent inspirations and future projects. The yarns featured in the photo are spun from Lleyni sheep and dyed naturally by Emma, really looking forward to working with this! Finally a little taster of a commission that I would love to finish by the end of the week, but suspect will be coming on holiday with me! The title of this collection refers to simple ,uncluttered stitchwork, natural fibres, limited palette and the role that light plays in the textures and folds of these three pieces. I am a huge fan of linen yarns. If you are looking for something hard wearing, then a 50/50 blend of linen and cotton is often a good and more affordable choice. Pure linen is a little more expensive, but offers some unique qualities. Many linen yarns have an almost wax like sheen that I find very appealing, this in turn seems to help make the yarn very pliable to work with and knitters are often surprised at how soft it is to work with. Stitchwork has a more relaxed feel than if you were using a yarn with a high twist on it, which I think fits with our less formal expectations of summer garments and accessories. This started me thinking about ways that I could highlight these unique properties. A complete contrast seemed to be the answer. What if I combined panels of pure linen with a silk/mohair mix. The result is Frances, where natural linen is highlighted by bands of vibrant coral. The contrast is continued both in the appearance of and the feel of the stitchwork. There is something really pleasing about running your hand across the surface of this throw and experiencing the different textures. Frances combines double crochet, with a lacy stitch and a clustered stitch and would suit crocheters of all levels. This piece is very personal to me because of its many associations. 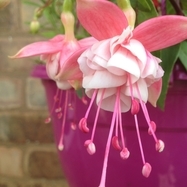 It was originally inspired by the basket of fuschias that hang outside my kitchen window, planted and tended by my daughter. The yarn choice was made when my dear friend, Fenella, took me to visit Elisabeth Beverley of plant-dyed wool. Elisabeth specialises in using plant dyes and so there are only ever small quantities of each colour available, which makes them all the more special. It also means that every project made is completely unique! Elisabeth lives in a tiny, converted chapel which you can visit by arrangement or on one of her open days. She attends a small numbers of shows each year too. Elizabeth's yarns are kept safely stored in tissue paper in lidded boxes, but when those lids are taken off, you will find that your breath is taken away. Deep, resounding indigos, sit side by side with ethereal pinks and greys and there are some colours that you would find hard to pinpoint because they are so unique! It took me ages to select the palette for Fenella, because there were so many different nuances to choose from. I am delighted with the result. 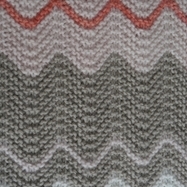 The simple chevron patterning for this scarf makes for a really relaxing knit, with just enough variations in colour changes to keep it interesting!. 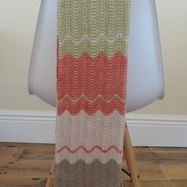 This design originally appeared in Knitting magazine, (August 2014), and was part of a collection featuring the British seaside and the need for a quick cover up due to our unpredictable weather. I used Rowan Softknit Cotton because it is a natural, breathable fibre, but also machine washable, which can be a bonus when you are away on holiday!. This yarn has great stitch definition and good drape. Simple stitchwork means that it is quick to make and holds its shape well. It may be a well-worn phrase, but I cannot think of a better way to describe the last few days. I have been busy working on magazine commissions, website downloads and a couple of kits for the festive season. I am not going to dwell on this, especially as I haven't had my summer holiday yet - but I look forward to sharing my ideas with you, when the time is right! In fact I knitted so much at the weekend, that I woke up on Monday with a sore shoulder and neck ache! Note to self - take more care with posture! Sadly, this also meant that I missed my last weaving class, but hope to resurrect my project in the autumn, when classes will start again. Last week I went to my first tapestry weaving lesson. I was inspired to join the class after visiting In the Woolshed at Chase Farm in Kenilworth a few weeks ago.. If you love sheep and hand -dyed yarn then you will love In the Woolshed. I will be sharing a lot more about the Woolshed over the next few months, but for now you may like to have a look at Emma's website to learn how this venture came into being and the ethos behind it. So why does a knit and crochet designer with more deadlines than she would care to mention take on another craft ? I am always fascinated by different textile traditions and how they can relate to or influence each other. There is quite a lot of preparation, threading up loom etc, but once your bobbins are wound, you soon start to fall into a rhythmic flow. Warp threads, (that's the ones that run vertically) are lifted and the bobbin is passed under the threads. It is a slow process, but one where you immediately feel very connected to what you are doing.I'll let you know how I get on!